Holy Saturday is very busy in every parish. While the Church encourages us to be still and silent, there is always a team of parishioners that is tasked with decorating the sanctuary, side chapel(s), and vestibule for the Easter Vigil. We do this so that all of our senses are engaged to gain a deeper understanding through beauty, sign, and symbol of the Solemnity of the Resurrection. This year was not different…well, maybe a little. As we were completing our task, a woman walked in with tears streaming down her face asking for a priest. The priests were unavailable so the front desk admin assistant asked if she would be willing to meet with a deacon instead and she agreed. While I was attempting to ascertain what the issue was that had her so upset, she shared that she was an Iranian Muslim and had become very disillusioned with her faith. She continued by saying that she had been reading anything and everything about religion and was left unsatisfied. Thirty minutes earlier she decided to start walking and enter into the first church she came upon. Her neighbor though, seeing her in distress walking down the sidewalk, offered to drive her to the nearest church – our Church. It just so happens that her neighbor was also one of our parishioners. After a few minutes, she calmed down and then I invited her to the Easter Vigil. Yep, you read correctly, the Easter Vigil. It occurred to me after the words left my mouth that I had just encouraged her to sit through the longest, albeit the most beautiful, liturgy of the year without context, catechesis, or frankly, a cheat sheet. She thought it was a fantastic idea! I saw her after the liturgy standing in our vestibule with tears again streaming down her face. This time though, with a smile. We sat down and she shared everything she had learned about Catholicism during the liturgy – and her theology was spot on. She said she was amazed that it engaged all five of her senses and just drew her in deeper and deeper. She shared with me that for the first time in her life, she encountered the God who loves her and who cares for her just the way she was at that moment. She said that God’s name was Jesus. She continued sharing and said that all of her problems were not solved but hope was restored. All the stress in her life was still pushing in but peace flooded and remained in her heart and mind. And I, well, suffice it to say that I am sure my mouth was gaping open, having never expected this type of transformative experience. I am not sure why I was so surprised at her experience. Maybe it is because I thought she needed to be evangelized and catechized before she could even consider what she was going to see. The fact of the matter is that the liturgy speaks for itself. That when celebrated in accordance with the mind and manner the Church intends (not saying that it has to be perfect…), it has the power to teach, transform, and touch the deepest recesses of our minds and hearts. It reminds me of the Scripture, “Deep calls unto deep” Psalms 42:7. As Catholics, we take for granted what we see, hear, touch, smell and even taste. Standing by watching what the Lord is doing for this young woman has resolved me to pay better attention to what is transpiring during the liturgy. It is a week later and she is excited for the next RCIA class to learn more about our faith. Our Lord is amazing. A providential encounter, an invitation, and a heart touched by grace. 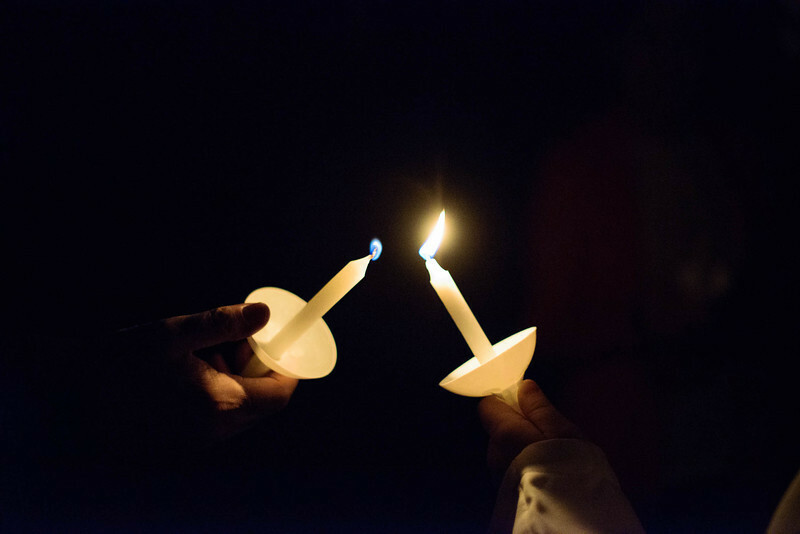 An Easter Vigil to remember. This entry was posted in Deacon Marques Silva and tagged catechism, Easter, Easter Vigil, encounter, evangelization, Holy Saturday, hope, invitation, liturgy, mystery, peace, psalms, RCIA, transformation. Bookmark the permalink. I have known other converts to have experienced similar experiences on the Easter Vigil in Arlington Diocese.